Let’s say it slowly: Li-quid eye-li-ner. For even the biggest makeup lovers, this cosmetics bag staple can bring a ton of anxiety. There are plenty of tutorials on how to get that liquid line just right, but mastering the cat eye is easier said than done. 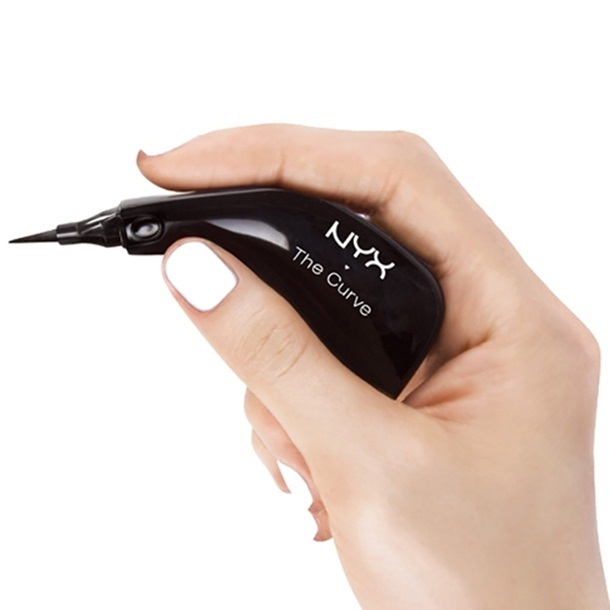 Behold, NYX’s The Curve, an eyeliner designed to create the foolproof winged liner look. No more gawking at Lauren Conrad’s glamorous wings and thinking you can’t achieve in your humble little bathroom, because with the Curve, you can get that chic look in a second. In a black vinyl package, it’s all about the liner’s odd shape that makes grasping the product so much easier than liners of the past. This leads to a more direct and controlled precision of lining with its felt tip (finally!). The quality of the liner is high, and also acts as a great base for layering with other eye pencils or gel formulas if you choose. The pigment is a perfect jet black and won’t smear or smudge. Because the process is so effortless, you’ll almost feel an urge to experiment with new liner looks. How about switching up that go-to cat-eye and trying some graphic eyeliner designs? So uncomplicated and fun to use, this underrated tool is what you’ve been searching for to get the perfect liner look.